As a big fan of the Polynesian resort, I’ll look for any excuse to visit when I’m not staying there. 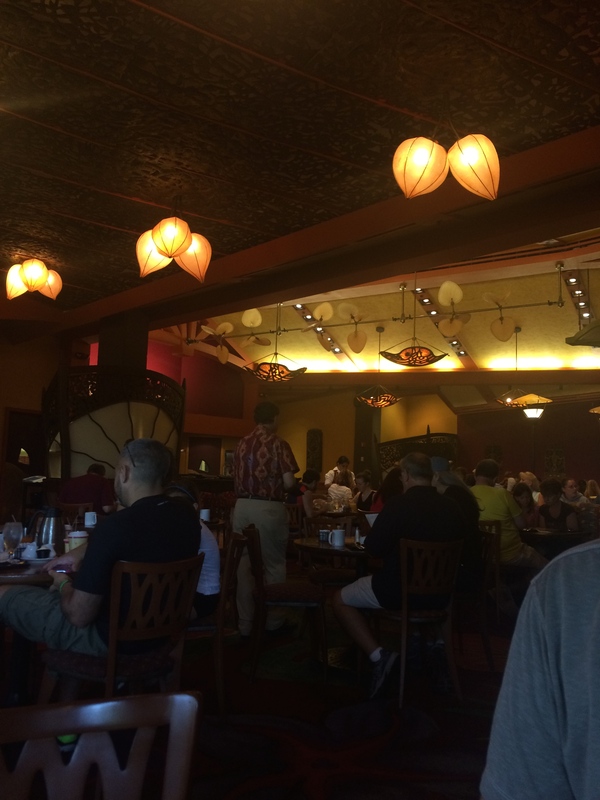 During my last trip, my excuse was Kona Cafe for breakfast, prior to a day at Typhoon Lagoon! I’d heard a lot of good things about Kona, but had always opted for ‘Ohana, another favorite for breakfast at the Poly. Being that this trip was just my husband and I, and he’s not really ‘into’ character meals we decided to hit up Kona instead. The menu at Kona grabbed my attention right away. I’m not a huge breakfast person but there were so many things that I could see myself ordering. It was hard having so many delicious options to choose from. The first part of our order, though, was a no brainer. The first thing that had caught my husband’s eye on the menu was the 100% Kona Coffee French Press Pot. As a coffee aficionado he was very excited to see a French Press option on the menu, since this is how he makes his coffee at home, and the coffee options at Disney World had always underwhelmed him. A little pricey at $7.99 per pot (2 cups) he decided it was a worthwhile splurge. On to the meal! While the most popular entree at Kona Cafe is Tonga Toast, it did not appeal to either my husband or myself. I went for the Macadamia-Pineapple Pancakes. 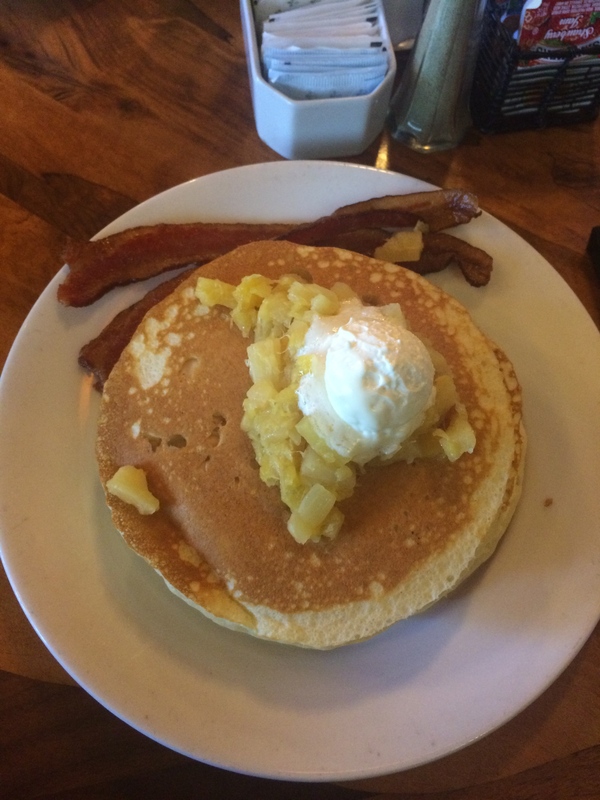 These pancakes have Macadamia Nut Butter, Pineapple Sauce, and your choice of Ham, Bacon, or Sausage. I went for the bacon. 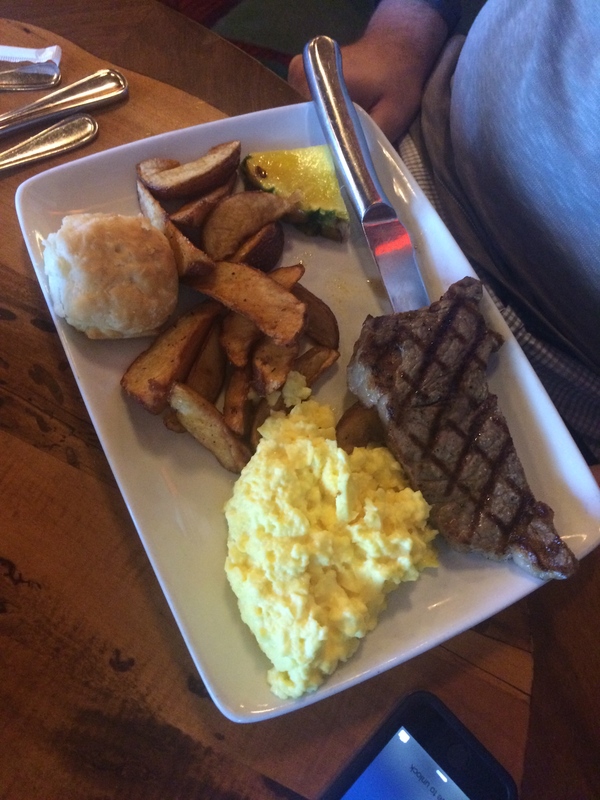 My husband chose the Steak and Eggs: A Char-grilled New York Strip Steak served with Two Eggs, Home-fried Potatoes, and a Biscuit. The pancakes were very good! I’m not a huge fan of macadamia nuts but they worked really well in the butter and with the pineapple topping. The serving size was very large, I didn’t end up being able to finish the pancakes even though I wanted to. My husband enjoyed his steak and eggs but was less impressed overall than I was. He said he still couldn’t complain because he was getting steak for breakfast, but that he might choose something different the next time we dine at Kona. It also didn’t stop him from cleaning his plate! Overall we really enjoyed our visit to Kona Cafe and would definitely make a repeat visit in the future, especially if we were staying at the Polynesian. I’d also consider trying Kona for lunch or dinner as their menu for those meals looks very appealing! Have you dined at Kona before? What did you think? 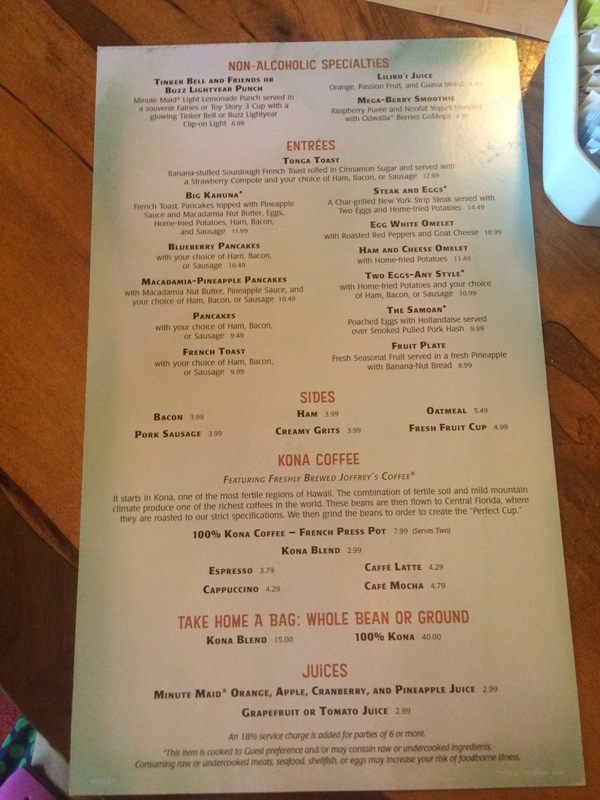 This entry was posted in Disney Dining, Disney World and tagged 'Ohana, breakfast, Disney World, french press, kona cafe, likikoi juice, POG juice, polynesian resort by Jamie. Bookmark the permalink.